Skiers descend from the summit of Mount Ellen. Peering over the edge of Stein’s Run at Vermont’s Sugarbush Resort, my stomach does a backflip. Named for Stein Erikson, the legendary Olympian who sited the trail back in the mid-’60s, Stein’s is a classically steep, double-black mogul run. Grooming the bumps the previous night made the trail manageable for solid blue skiers like myself, but its pitch still made me nervous. 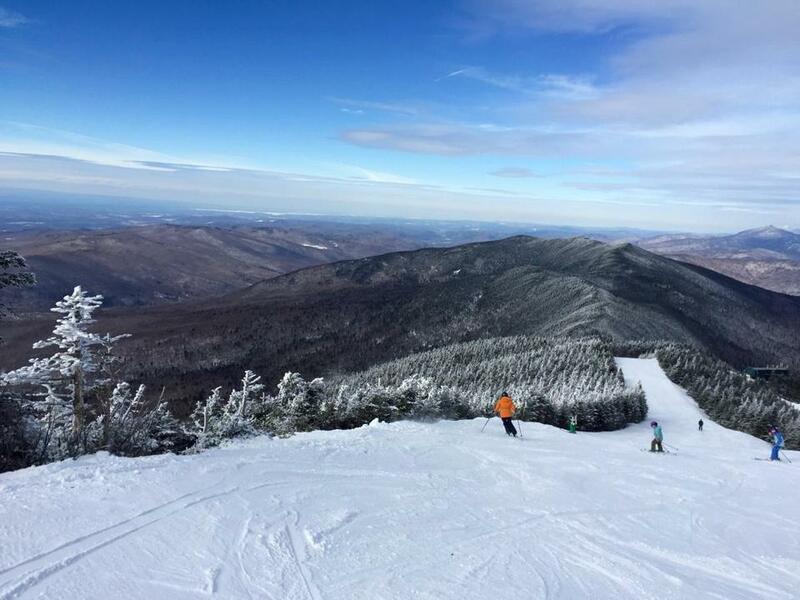 Ahead of me, Win Smith Jr., majority owner of Sugarbush, sailed dynamically down the mountain carving the day’s first tracks, my 11-year-old daughter at his heels. Skiing early ups with Smith was a fitting way to end the weekend — watching him cruise the slopes or stroll through Lincoln Peak village with Rumble, his big Bernese mountain dog, evokes images of the resort’s earliest years, when its owners could be found enjoying après ski cocktails and fondue with friends in the Wunderbar. I’d spent the past two days sampling the sweetness of Sugarbush, a resort with two distinct mountain personalities, outstanding terrain across three peaks, and a compelling backstory that begins with Sara and Damon Gadd on Christmas Day 1958. Members of New York’s elite, the newlywed Gadds landed in Vermont in the mid-’50s, living and skiing in the Mad River Valley. Craving more than the limited amenities offered by the valley’s only ski area, Mad River Glen, the couple set their sites on creating a deluxe mountain resort with a sophistication that rivaled European destinations like Gstaad and St. Moritz. After searching in several states with their friend Jack Murphy, a rough-around-the-edges Bronx native and then manager at Mad River, the three found the perfect spot in their own backyard. They built a chic Italian gondola, cut classic trails down Lincoln Peak, and hired Peter Estin, international racer and jet-setter, to run the ski school. As they hoped, Sugarbush Valley quickly became a place to see and be seen, drawing a glittering crowd of café society socialites that included musician Skitch Henderson, actress Kim Novak, restaurateur Vince Sardi, and members of the Kennedy clan. But in the midst of the glitz, something was lacking — the laid back, family-friendly atmosphere that defined New England skiing — and in 1963 Glen Ellen opened to fill the gap. Launching a new resort a few miles south of Sugarbush Valley’s gilded slopes required a certain amount of chutzpah, but Walt Elliot, a Texas native-turned-New Yorker, had what it took. Mount Ellen boasted more vertical than its swanky neighbor, but with none of the crowds. With a social scene centering around the Golden Thistle, the mountain’s well-loved base lodge bar, Glen Ellen became known for it’s themed parties, jovial après ski festivities, and marathon Sunday brunches that began at noon and lasted until 8 p.m. Afternoons saw skiers popping champagne — legend has it that if the cork hit the cowbell hanging from the ceiling, you drank for free — and talking with Walt himself about their days on the mountain. Elliot sold Glen Ellen in 1973 and shortly thereafter the Gadd’s golden era drew to a close, as well. The two mountains joined under the Sugarbush name in the late ’70s, and the resort assumed myriad images — good and bad — under multiple owners before Mr. Smith and his Summit Ventures partnership took the helm in 2001. Committed to returning Sugarbush to the spirited hamlet of its heyday, Smith launched an ambitious master plan for the resort’s revitalization. The first phase opened in 2006 to include Timbers Restaurant, the plush Clay Brook Hotel, and a much-needed overhaul of the Gate House base lodge. Now, a decade after its renaissance, the resort’s future is sustainable in a way that the fickle affections of its early jet-setting clientele and later corporate-minded owners never ensured. Sugarbush newcomers should begin at Lincoln Peak, which embodies every creature comfort the Gadds could have imagined. Unlike McMountain-style compounds that have grown in popularity throughout North America, Sugarbush retains the look and feel of the valley it calls home, where farmhouses, country inns, and historic covered bridges punctuate the landscape. Nestled at the base of Lincoln Peak, a cluster of buildings stand styled in the Vermont vernacular. The effect is that of a small village, complete with an old-fashioned schoolhouse — it even has a bell. Contrasting Lincoln Peak’s face lift, Mount Ellen’s original lodge has a retro ’60s vibe, and though the Golden Thistle has been renamed the Green Mountain Lounge, the bar exudes the same easy energy it did 50 years ago. A recent Saturday saw skiers and riders three deep at the bar at lunchtime, Bloody Marys in hand. And the infamous cowbell? That resides with the Elliot family, though Tracie Elliot Condon, Walt Elliot’s daughter, recently presented a replacement, a bright tribute to bygone days. Despite its old Mascara Mountain moniker, terrain at Sugarbush has never been for snow bunnies. Though every area except Castlerock, the third-highest peak, offers an easy way down, hard-core skiers revel in deep glades and expert trails like Mount Ellen’s FIS, and the gnarly Castlerock favorite, Rumble, for which the resort’s four-legged mascot was named. Which brings me back to my perch on top of Stein’s. Digging my edges into the snow, I regard the valley spread out far beyond the tips of my skis — the same view that attracted Murphy and the Gadds in the first place. Carving wide turns, I make my way down Stein’s to where Smith and my daughter were waiting to congratulate me on my first ever double-black-diamond success.